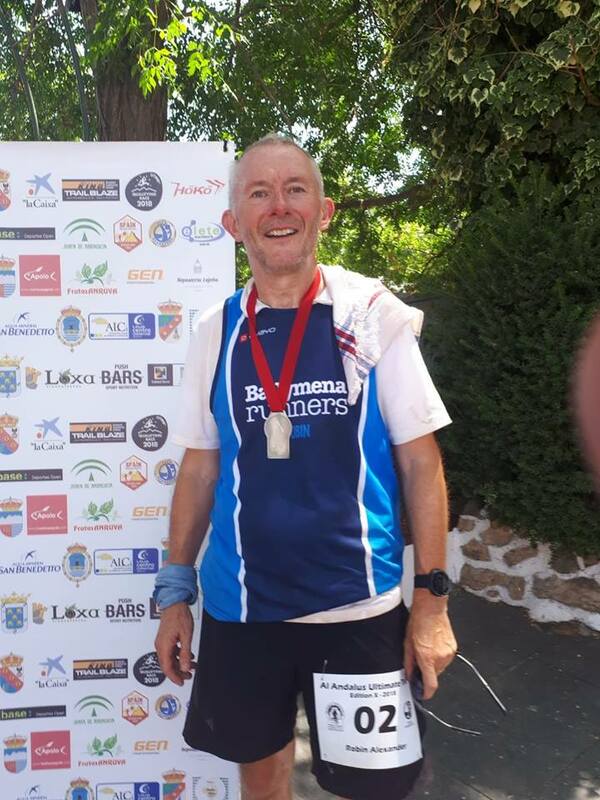 Whilst many of us were enjoying a few days off Ballymena Runners club secretary Robin Alexander decamped to Andalusia in southern Spain to compete in the 5-stage 230km ultra-marathon Al Andalus Ultimate Trail race (AAUT). Featuring intense heat, diverse terrain and scenic natural parks in the mountains above Malaga the AAUT, now in its 10th year, has earned the respect of the international running community with each day presenting a new running challenge through the Poniente Granadino. Stage One was a 39km run from Loja to Alhama de Granada which presented competitors with a total ascent of 1330 metres through some desert landscape. Robin finished 20th in 5:28:21, before camping overnight to face Stage Two which stretched a remarkable 48km from Alhama de Granada to Játar and a climb of 1640 metres! Again, Robin produced another remarkable performance to complete in 7:56:39 for 21st spot. The unrelenting action continued on Wednesday with another 39km stage from Játar to Jayena. Robin got round in 5:04:19 to superbly finish 14th in the field. But undoubtedly the most challenging stage was Thursday’s 67km (41 miles) run from Jayena back to Alhama de Granada. Not only was it the longest stage it also included a total ascent of 2031 metres, or over 5000 feet! And Robin didn’t make things any easier for himself by taking a wrong turn at one point to add a couple of extra miles to the distance. Despite this Robin finished 21st in 11:17:44. By comparison, the fifth and final stage on Friday was an ‘easier’ 37km from Alhama de Granada to Loja, with a total ascent of 1120 metres, which Robin completed in 5:44:45. Overall, Robin finished 21st in the General Classification, in a total time of 35 hours 31 minutes 9 seconds … a truly remarkable performance in some very testing conditions. Ballymena Runners were out in force at the numerous Saturday morning parkrun events around the country. Locally, at Ecos, David Law was first home out of the 122-strong field in 17:36 while Judith Worthington was first lady in a time of 21:09. Conor Crilly finished third overall, setting a new parkrun personal best (19:22) in the process. Further afield, John Hasson finished first (21:27) in Inch Beach near Tralee, while Ian McCracken claimed a top ten finish and PB (19:10) in Weymouth. Elsewhere Harry Armstrong could be found at Falls event in parkrun, David McClelland, David McKean and Paul McClurkin travelled to Portrush, Robert Meban was in Cookstown, Beverly Kidd in Limavady, Roy White at Valley with Tim Hawksworth and Jennifer Dickson popping up at Ormeau.